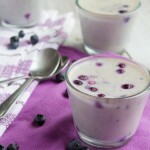 Cups of dairy-free panna cotta, flavored with notes of white chocolate and sweetened with fresh blueberries. Add ¼ cup of the coconut milk to a small bowl. Add the gelatin and stir to combine until completely smooth. Then, add collagen and stir again until smooth. Set aside. Add remaining coconut milk, cacao butter, vanilla and xylitol to a small saucepan. Bring to a boil over medium heat, until cacao butter is melted. Stir for 2-3 minutes for xylitol to dissolve. Whisk in collagen mixture. Remove from heat and whisk for 1-2 minutes. Drop in blueberries, give a little stir. Pour into 4 small cups. I used 150mL cups. Place on a baking sheet and chill in the fridge for 2 hours. Cacao Butter: is the fat from chocolate which gives this low-carb panna cotta it’s white chocolate flavor. You could also use coconut oil, but it would change the flavor slightly. Xylitol: feel free to use your favorite sweetener here. Alcohol-free stevia would be nice. And, if you have a sugar-free pallet (ie. 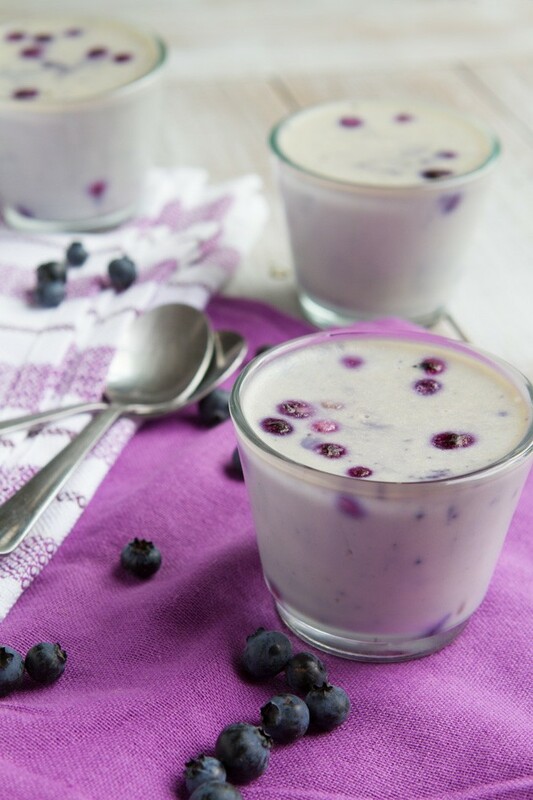 you’ve been doing sugar-free for a pretty long time) you may find that you don’t need to sweeten this keto dessert at all.